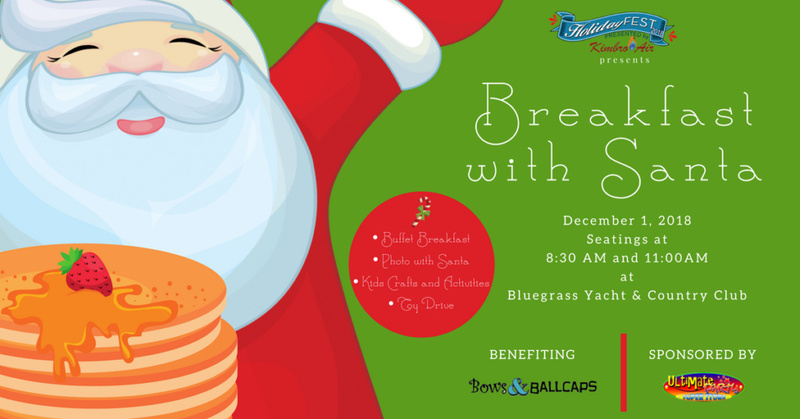 Join HolidayFest for Breakfast with Santa benefiting Bows& Ballcaps! Children and Families love this traditional breakfast with Santa as well as many of his friends, Mrs. Santa, Elves, Princes, the Grinch and many others have come to entertain! You just never know who will be here! Bows & Ballcaps is a charitable organization dedicated to offering love and support to kids fighting cancer, especially those who have lost their hair from their treatments. It was founded in 2013 by then ten-year-old Hannah Grubbs, a girl who has been bald her entire life from Alopecia Areata. Hannah lost her hair from Alopecia before she was one year old, and she has real-life, first-hand experience with what it’s like to live without hair. Her mission is to encourage other kids to be comfortable and confident being bald, and to remind them that it is what’s on the inside that really matters. Hannah’s message to the world is that we all have a beautiful light inside of us that makes us unique and special.